In Transhumanity's Fate, you play secret agents protecting the scattered remnants of transhumanity from threats that could wipe it out once and for all. You might be a crusading hacktivist, an anarchist militia fighter, a planet-hopping xenoscientist, a psychic detective, or a social networker owed favors by all the right people. You’re a transhuman—a genetically modified human, an intelligent animal, a mind in a robotic shell, or even a bodiless artificial generalized intelligence. Your body is heavily upgraded, and your mind can communicate with every electronic device around it. You need every advantage, because you’re up against mutants infected with an alien virus, WMD dealers, corrupted AGI god-minds, shifty amoeboid alien merchants, rampaging alien wildlife, and the ultimate threat: transhumanity’s own self-destructive capabilities. Firewall recruited you because you’re resourceful, you have needed expertise, or maybe you saw something you shouldn’t have but handled it well where most people would have fled in terror. Maybe you lost everything in the Fall, maybe you’re an idealist who thinks they can fix everything, or maybe you’re just looking for a good fight. You’ve passed our loyalty tests—for now—and proven you’re ready. One thing we all agree on: transhumanity stands on the brink of extinction. We all feel called to act, and with a viewpoint that’s galactic, not local. Extinction is coming. Will you fight it? Transhumanity's Fate brings technothriller espionage and horror in the world of Eclipse Phase to the Fate Core system. Join Firewall, and defend transhumanity in the aftermath of near annihilation by artificial intelligence! 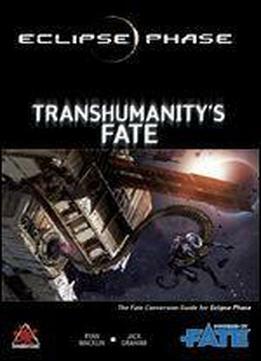 Transhumanity's Fate requires Fate Core System from Evil Hat Productions. Transhumanity's Fate is a 144 page full-color hyperlinked and layered PDF, 6x9", and is Creative Commons (BY-NC-SA) licensed. The print version will be available in Summer 2016.